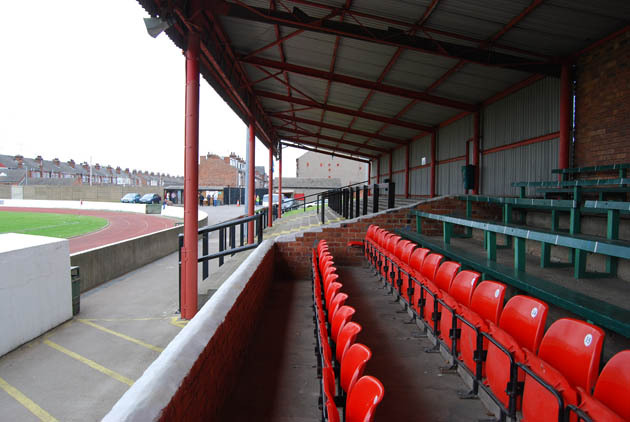 Destination: Victoria Pleasure Ground, Marcus Street, Goole, East Riding, DN14 6TN. 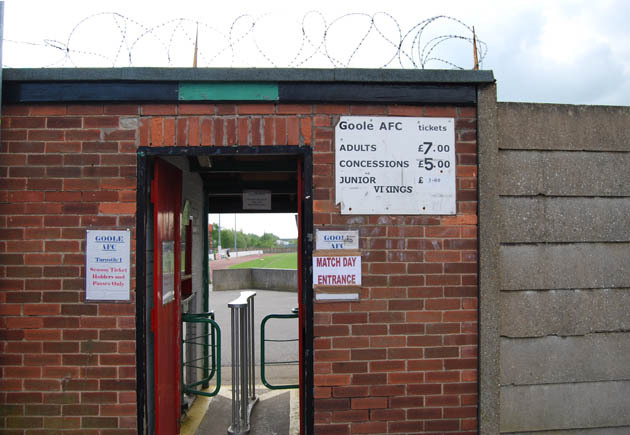 Directions: Goole’s VPG ground is a really handy one to get to – ample street parking, or just five minutes walk from the rail station (and with a decent fish & chip emporium or two around it). Go by train, and if approaching from the west you’ll pass right by the ground just before you arrive at Goole station. So you should be able to follow your nose anyway, but if not then just turn right when exiting the station onto the main street, and go up this for a couple of hundred yards. The Goole AFC Ground is then signposted, and is a left turn down Carter Street opposite a big Tescos. The ground is then visible in front of you at the end of Carter Street. 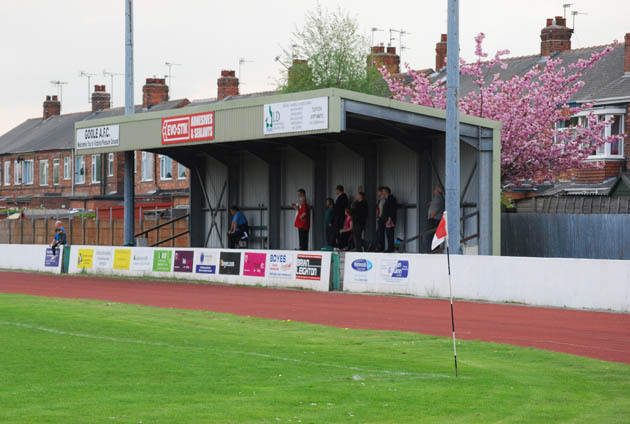 Off The Pitch: Although it has a much more modern feel, Goole AFC’s Victoria Pleasure Ground (or VPG) stadium is actually well over a hundred years old, having been used for various different sporting and athletic events since opening in 1888. 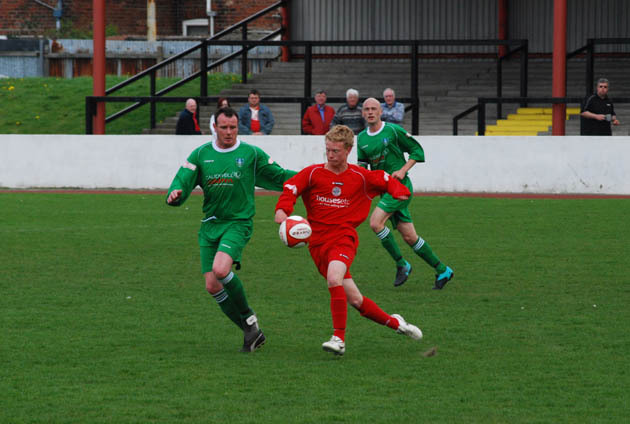 The club has its roots in the former Goole Town, who formed in 1912 and then moved into the VPG thereafter, so by my reckoning there must be some sort of ground centenary due shortly. Although it is a ground with the dreaded athletics track round the outside of the pitch, it’s only a narrow four-lane track, and doesn’t detract from the atmosphere/feeling of closeness in my opinion. Especially seeing as the two main spectator areas are down the sides of the pitch, meaning that you’re only a few yards further away from the pitch than otherwise, and both stands have a decent, slightly elevated view to compensate. The only real drawback in fact, seems to me that you probably get about 10 minutes less football played over the course of the game, as players are having to spend additional time fetching the ball whenever it goes behind either of the goals or out for a throw-in! 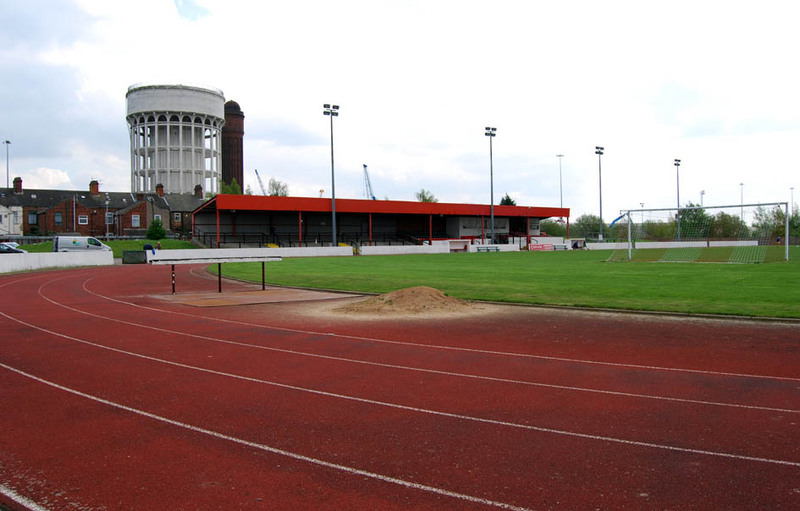 The ground has two stands facing each other across the halfway line. One consists of a medium-sized covered area with five steps of terracing, while the other is an impressive looking combination of covered standing and covered seating. The latter stand is the larger of the two, and also houses the press/p.a. area, and some social facilities for match sponsors. Unless there is an unusually large sized crowd present, the two stands combined present ample accommodation and a good choice of viewing for spectators. 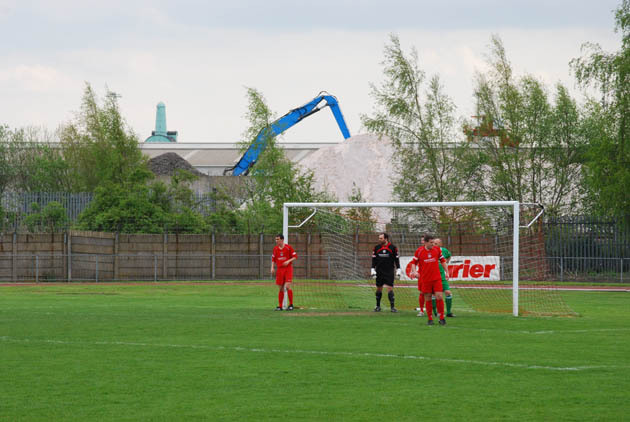 As well as being able to walk all the way round the outside of the pitch, if the weather is good there is also a small amount of uncovered sloped terracing available next to the main stand. 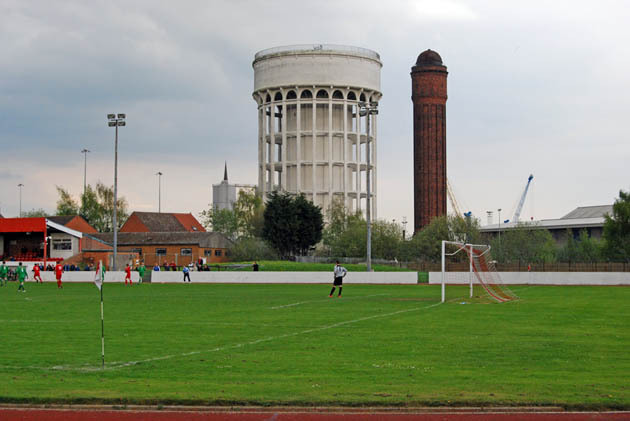 With the ‘salt & pepper pot’ water towers, a mixture of industrial and leafy backdrops and several rows of terraced houses looming in the distance, overall the ground has a really nice feel to it. I know some people have an aversion to any grounds with athletics tracks round them, but personally I don’t feel it detracts much at all in this case and would wholeheartedly recommend a visit. Aside from the apparent lack of club house at the moment, a really friendly and well run club. Shop-wise, you have a club shop selling a small range of merchandise and a few hundred old football programmes of an assortment of clubs; and the obligatory tea bar, which recives a double thumbs up from me for its extra large mugs of tea for just 70 pence. The display board with team line-ups and winning raffle numbers displayed on it is a nice touch too. On The Pitch: Kidsgrove came into this game in the play-off positions, while Goole were mid-table and safe from further excitement, which of course effects their end-of-season attendances somewhat. 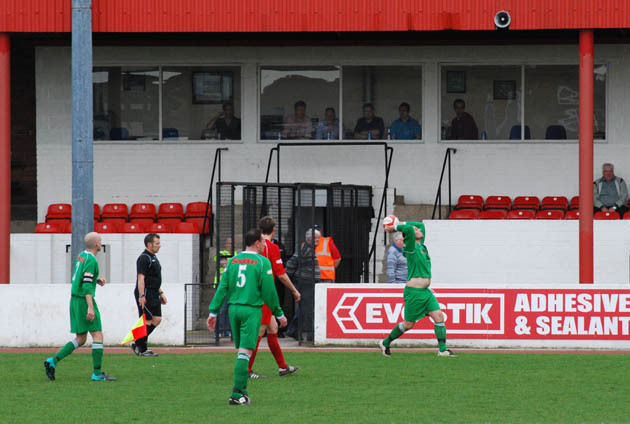 The game was nil-nil and a bit drab at half-time. Things then livened up after the break with the visitors awarded a penalty on the hour. One of the Kidsgrove forwards had their heels clipped by the last Goole defender when clean through on goal, and David Walker duly sent the keeper the wrong way to put them 1-0 up. I thought this may have been the end of things as a contest, but full credit to the home side, who if anything then increased their efforts and got a deserved equialiser with 10 mins remaining, Simon Harrison stealing in unmarked at the back post following a right-wing cross and accurately burying his header into an empty net. A draw was a fair result, and ultimately the lively second half had made the game a good one to watch, despite being close to the end of the season and only one team with anything left at stake. 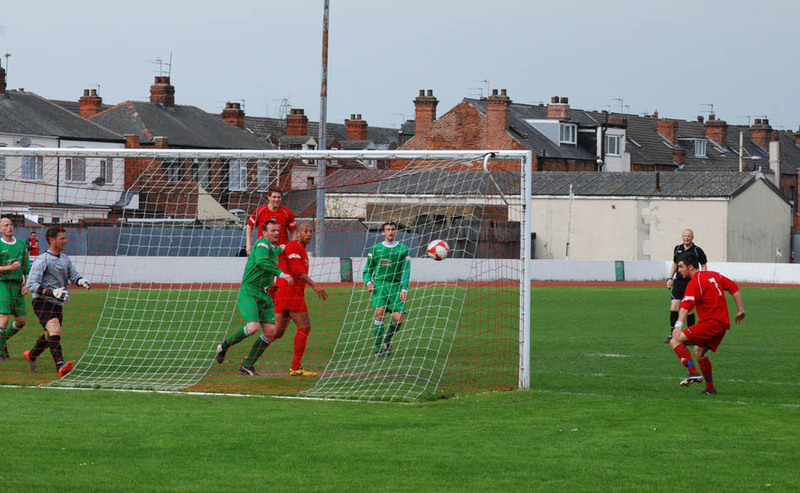 This entry was posted in A-Z by club (home team), Goole AFC. Bookmark the permalink.